It has been a long week for us. A fun week but definitely long. 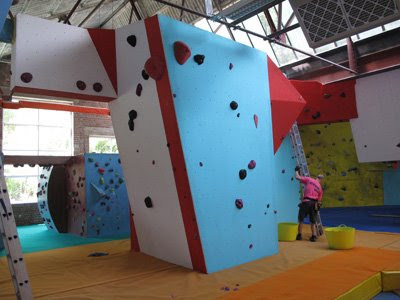 This morning Percy, Sam and 'Britian's former Manliest Man' Pickles set to work putting some holds on the new walls. As I write the boys are testing the 40+ problems that they've managed to set today. More will go on next week. The only wall not open is the new 'Master's wall' which is the one Craig is painting his masterpiece on. He's still got a bit to do so it will be early next week before that is open. Saying that it is a beautiful thing he is creating and it also feels wrong to put holds on it....but we will. So thats it. A big refurb done on a 1/3 of the wall. 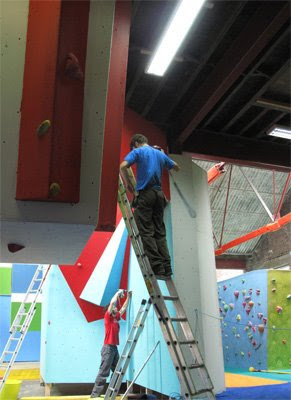 Below are some photos and a bit of video of one of the new problems. Thanks for your patience and enjoy! !